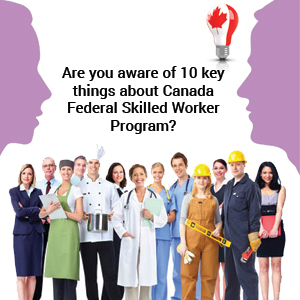 Are you Aware of 10 Key Things About Canada Federal Skilled Worker Program? Canada federal skilled worker program (FSWP) 2014 has most recently become the hot topic among immigration aspirants. This is because Citizenship and Immigration Canada (CIC) re-opened the renowned FSW program with new caps and occupations. All the changes made to FSWP, which tend to pull several immigrants across the globe to Canada, came into effect from 1 May 2014. In such a scenario, every prospective applicant should definitely know few things about FSW program. Prominent occupations belonging to fields such as health services, finance, nursing and management are included in the newCanada FSW occupation list 2014 comprising 50 eligible occupations. Applicants who have applied for previous Canada Federal Skilled Worker Program (FSWP) 2014, but got back due to the filling of cap can re-apply if they still satisfy the required eligibility criteria. The eligibility criteria for the Canada Federal Skilled Worker Program (FSWP) 2014 remained unchanged. So, the candidate should score a minimum of 67 points in the points-grid system, which considers factors like age, education, work experience, adaptability and language requirements. If a designated organization had already assessed educational credentials, the assessment reports can be re-used for the current Canada FSW Program 2014. Canada FSW Program 2014 is accepting multiple applications by a single individual. So the applicants can apply as many times as they wish under same or multiple programs. No new forms are required. Existing application forms may be used in Canada FSW Program 2014. According to Canada FSW Program 2014 As long as the part-time work experience is remunerated, unbroken, and happened within recent ten years, it can be counted as work experience. The Canada FSW Program 2014 applicant should satisfy the same language requirements i.e. proficiency in either English or French is required. Measures are being taken to reduce processing times for Canada FSW Program 2014 to less than a year. In Canada FSW Program 2014, This is the last opportunity to apply directly to FSWP as a new immigration system referred to as ‘Express Entry’ will be brought into effect on 1 January 2015. Express Entry is designed to pre-select applicants from various programs, which include FSWP.